Jack finally kills his first human, officially making the series more adult and changing Jack forever. It's amazing how the use of red blood in general adds more maturity to the series. Samurai Jack never felt really violent until now. 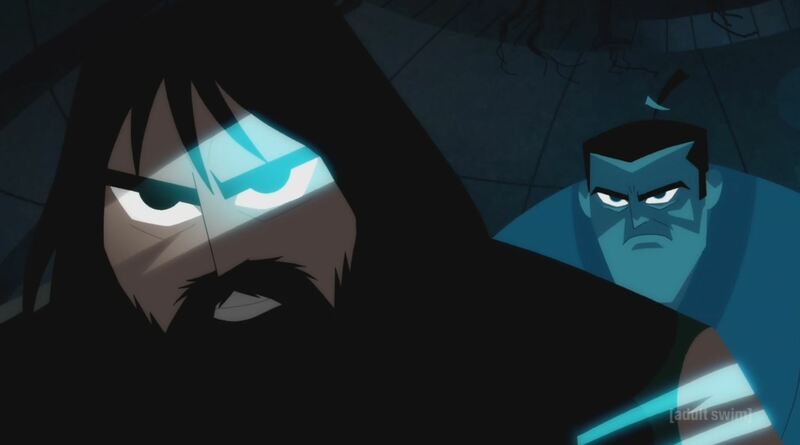 Regardless, Jack faces off for the first time against the "Daughters of Aku." They are merciless, organized and quickly dominate him. The get him off guard and remove his armor and arms. 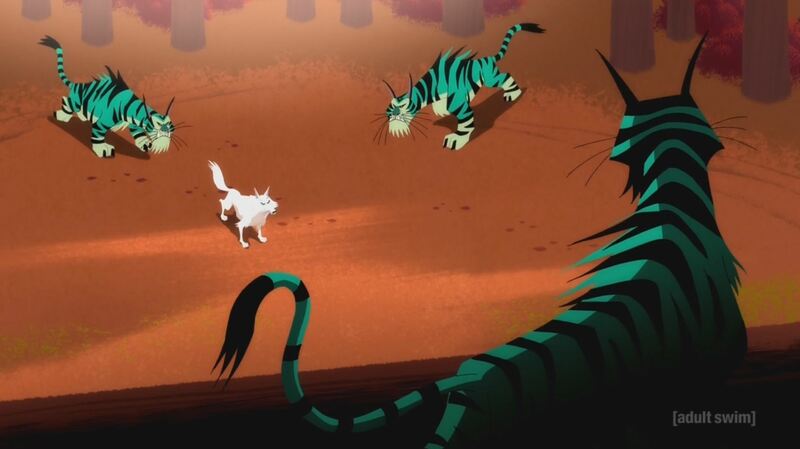 As the fight begins, we simultaneously see a white wolf, fighting against three large tiger-like beasts. Like Jack, it's outnumbered and desperate. To escape the barrage Jack retreats, where he has a conversation with himself. During this conversation it's foreshadowed that Jack will kill a human. 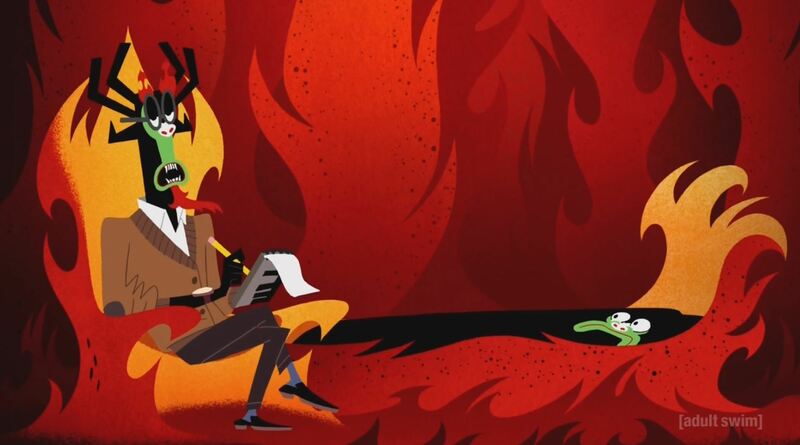 He tells himself that Aku just sends robot, and they are "just nuts and bolts, just nuts and bolts." Jack makes a risky run towards a safety, we are treated to a nice slow down scene in the rain. 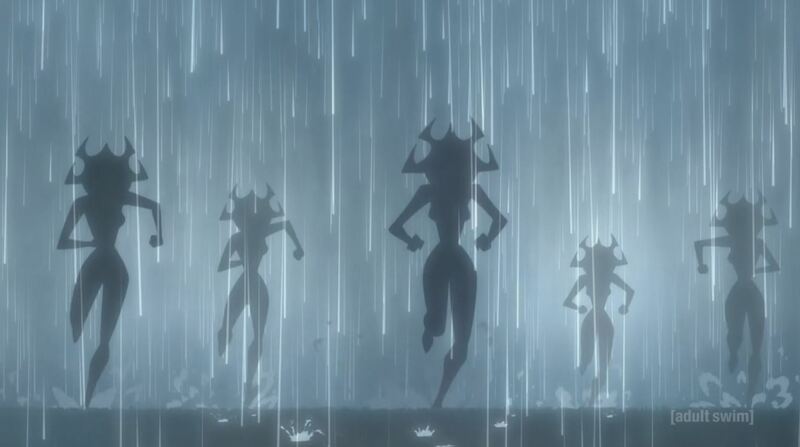 Jack finally sees the Daughters of Aku. The sisters are separated, as they search for Jack. The sisters blend into the shadows of the ruins, Jack finally comes out of hiding. Two of the sisters attack him in the shadows, he manages to hold his own while fleeing when necessary. Jack fights off all the sisters together, but only can evade, then run for his life. He eventually gets his one on one against a sister and kill her with her own weapon. When Jack finally kills one of the sisters he's literal stripped down to almost nothing and is petrified. He is stunned that she's was human and even in death she managed to wound him. We finally cut back to the white wolf, he's defeated his attackers but doesn't appear alive. Could that be foreshadowing of Jack's fate? This episode was spectacular, the tone was intense, the animation, camera angles and music, were all effective. Even though I knew that Jack was going to kill his first person in this episode, the suspense created still made it an effective moment. The symbolism with the wolf was a nice touch as well.